Today we were joined by Dr. Jeffrey Tharsen of University of Chicago to learn about his research and projects related to premodern Chinese digital philology and phonology. Jeff mentioned Donald Sturgeon‘s Chinese Text Project as another example of this idea: an interface for an aggregated body of sources. The CTP also provides APIs for connecting other tools with it, such as the MARKUS reading and text analysis platform. Jeff has also been working with aggregating information to be able to figure out the historical sounds of characters, and look at things like rhyme in early Chinese poetry. 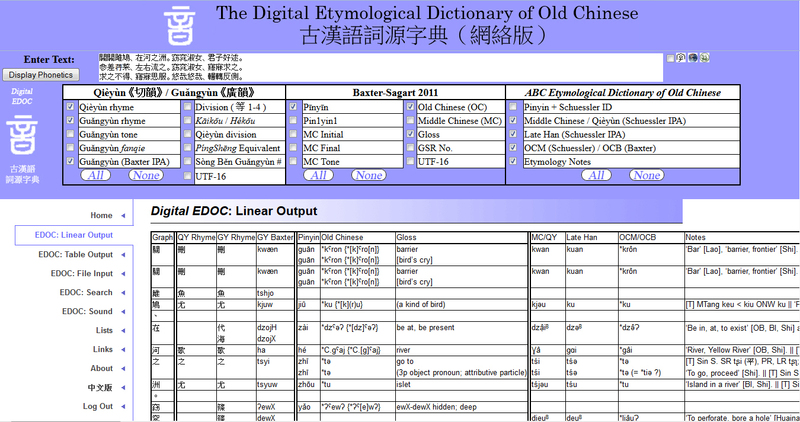 He created the Digital EDOC etymological dictionary to bring together many sources (via a database on his site, not APIs) to analyze early phonology, and gave us a demo of this dictionary as well. Some questions that he fielded were about working with Classical Chinese for NLP. Is it harder than other languages, and if so, what are its particular atributes? Jeff answered that in Chinese, it’s not as hard because you can work with unigrams and have no conjugation, case, etc. However, tokenization is really hard: especially with two-, three-, four-character combination words, proper names, and so on. Where are the borders of the “words”? It is extremely hard to do this in Classical Chinese and no tokenizer exists for it as of now. Thus, this language is both easier and more difficult to work with, in different ways. A WORD LAB participant also asked about the future of Digital EDOC. Per Jeff, Donald Sturgeon has been asking for an API to connect their projects. But currently, Jeff’s site operates entirely on its own database, rather than being a composition of live queries from other sites’ APIs. It does, however, link to other sites for more information about different aspects of characters in the search results. Finally, Jeff is also interested in poetry’s meter vs. number of syllables, and refers us to Poemage at Utah for an English example of this kind of analysis.